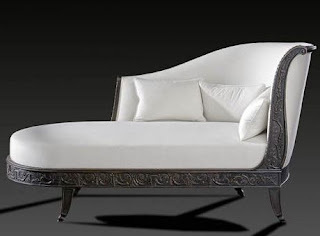 This sofa, or "Antique Ottoman" or Antique settee, is owed to the work of the french cabinet-maker Delenoncourt, who mastered his craft in 1752 and made many archaistic Regency-type chairs. 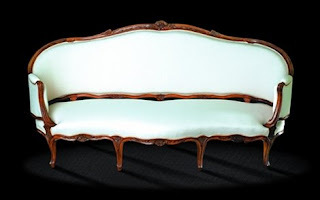 The very type of this antique corbeille chair demands a degree of virtuosity. 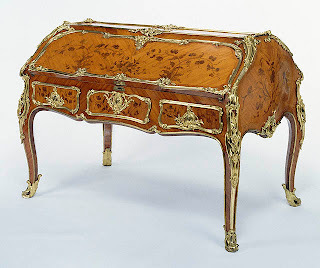 Delenoncourt shows here his merit as a joiner possessing the canons of the style of his period, through the softened curves of the legs and the floral repertoire sculpted with art: hooks, peonies and roses, delicate foliage scrolls and subtle little flowers. Note the cross rails of the back and bolsters, visible and prettily designed on a type of chair that normally comes with hidden rails.